Technology has changed the way of advertising to some extent, not completely and the outdoor advertising kiosk is a live example of the same. We are India’s one of the prominent outdoor advertising company in Ahmedabad bringing off that outdoor advertising kiosks with the touch of the modernization to make it more interesting and inevitable for every passerby. We are in the business of the outdoor advertising for more than 85 years and hence qualified to understand current trends and accordingly alter the way of advertising that can give your business a notable boost. Our comprehensive range of outdoor advertising kiosk from the traditional one to the digitalized one is an evidence of our qualification in the outdoor advertising kiosk. The kiosks, pole kiosk, digital kiosks and LCD digital signage kiosks are the assortments we have to make your brand recognized as you desire. Other than alternatives in the outdoor advertising kiosks, we share 1000+ locations in Ahmedabad only to give you a location of your choice and target the audience that you find most relevant to your service/product. Apart from that, we know every strategy to give the highest possible coverage for your product through outdoor advertise kiosks, hence guarantee to build greater brand identity and ultimately deliver highest returns on investment. Be it street, roads, malls, airport or any other crowded place, our kiosks are designed and placed leveraging experience to increase customer base at cost effective rates, our sustainability in the business and 1000+ clients speak lots more about our expertise than us. 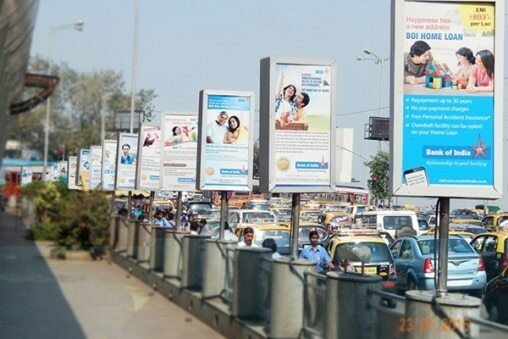 Let us prove our awesomeness in outdoor advertising kiosk in Ahmedabad by contacting us today.